All painters are not created equal. Find out what we do different. We offer a variety of services to get the job done from prepping to the finish. Call us or fill out our contact form here and you’ll be first on our list. 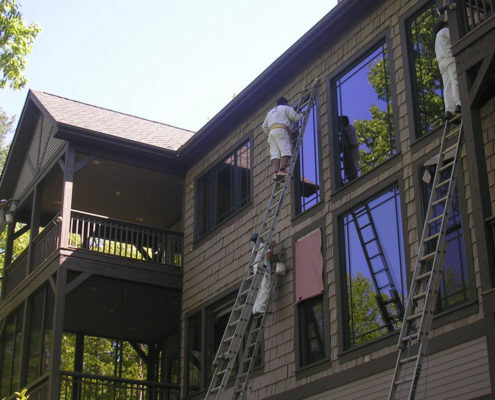 Jackson Painting crews are all trained and knowledgeable to our systems. First, we power wash and do all the necessary prep work. Then, we do all the rolling and back brushing by hand. The overall surface is completely covered when it is hand rolled instead of sprayed. Hand painting into the fibers of the wood surface evenly gives a consistent appearance over time as the paint or stain fades. 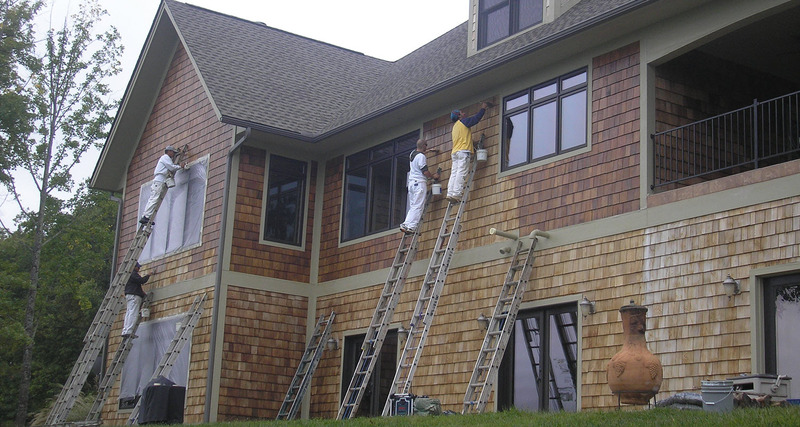 During a spraying job, a painter is likely to load up the coating when they’re coming in on the side. Then, barely putting it on as they pull away. Hence an uneven surface of mill thickness across the boards or wall. There are often problems with overspray and uneven mill thicknesses on the surfaces. When it fades over time, it doesn’t fade symmetrically. Jackson Painting will run the boards wet to wet, four to six boards at a time, corner to corner. No lines will appear on the boards. The painted surface fades evenly over time. To give a uniform and proper application, we recommend hand painting applications over spray painting applications. We meet with each client and explain how we do our job and why we follow a precise procedure. 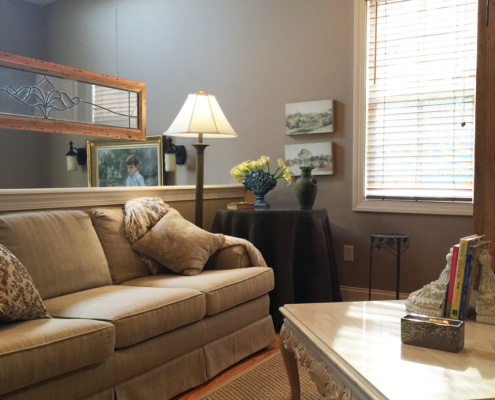 If an interior is scheduled to paint, we customize the best scenario for each client. We start in a room or location of the home that is most convenient for them. We discuss how we are going to break the room down (where to move furniture). We will explain how the belongings will be handled properly and taken care of before we begin. 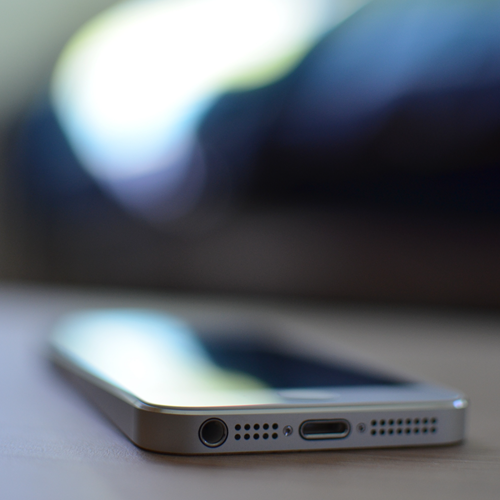 Our crew will take a digital picture of your arrangements and furniture layout before moving anything. Afterward, we use these digital photos to reassemble the contents to their original location and arrangement. Our proof of insurance is sent to the client before work begins. We work together to get our clients what they want, so they are 100% satisfied. And our high satisfaction rate proves it. 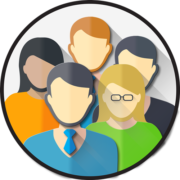 Our established procedures and conscientiousness set us apart from other companies. We have 55 ladders to reach any area, two vans, two trucks and every piece of equipment to get the job done. We are prepared to do anything requested. We operate boom lifts too. 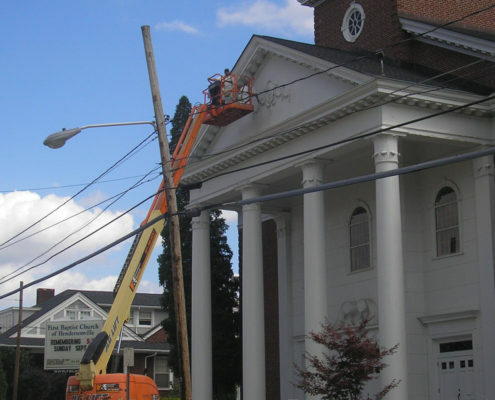 We can even hang from church steeples to get the job done! We will be happy to speak with you about your next project! Jackson Painting has painted three of my homes…and each time I’m pleased and amazed at how respectful, professional and skilled they are! This time was no exception. They painted my 2500 sq. ft. townhome faster than I imagined and made it seem effortless. They painted two coats on ceilings (high cathedral), walls and trim. They were very careful about my furnishings and left everything as they had found it…. even putting my accessories back in place and in the right spot! I didn’t have to lift a finger…they did it all. They were quiet as they worked (I work at home) and very polite. They cleaned up and left me a brand new home with new walls and ceilings I love. Since then three of my neighbors have hired them and have been equally as impressed. I will continue to recommend Jackson Painting for any paint jobs I have! A++++ company! We contracted Jackson Painting to paint our living room and stairwell. The crew was punctual, thorough and always on task. They were very careful with the removal of curtains, pictures and furniture. The walls were patched and repaired. The paint went on expertly and the entire crew was solely intent on doing their job; no cell phones and no loud music. When the job was completed everything was back in place. It was wonderful for us to experience a job so well done in such a professional manner. We contracted with Jackson Painting upon recommendation of several of their clients. Jackson Painting lived up to their reputation. The entire process from bidding the job to completion was done in a very professional manner. The painters were prompt, courteous and careful with our furniture and floors. The finished job has garnered praise from visiting friends and family. Jackson Painting gets our seal of approval. 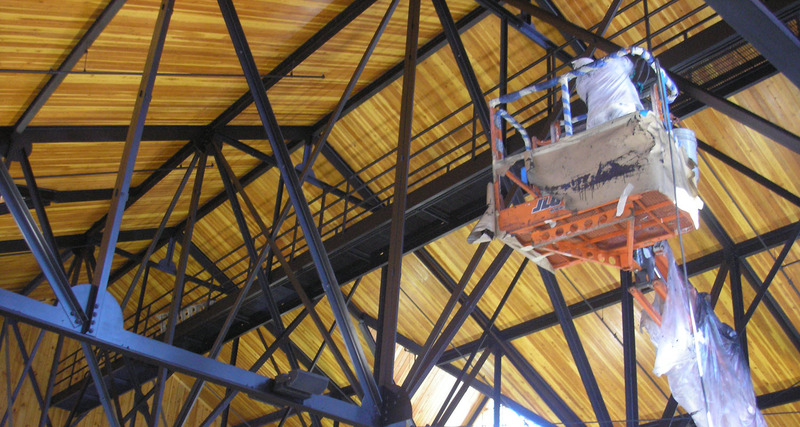 The most important aspect of the work of Jackson Painters is the high quality of their work. Before engaging them, I interviewed several neighbors who had used them to paint the insides of their homes. All spoke glowingly of their work. I found their large team to be punctual, efficient, polite and neat. I did not realize how important it is to have more than two men paint a room as it is a very time-consuming, disruptive job, but with 4 or 5 people tackling it, the job gets done much more quickly. Their team worked long hours and accomplished their task in record time. And all this was done for a reasonable price. No wonder the Jackson Paint truck seems to know its way to Towne Place. You can’t go wrong with them. This company is excellent. Obviously a good company to work for since their painters are experienced, long-time employees. They work quickly but meticulously. Clean up – perfect. I have used Jackson on two major occasions: when we first moved to Hendersonville, they painted the entire house, inside and out, we had purchased. More recently, they have painted several rooms in my current home, my garage, and all the white woodwork including lovely crown molding. The beginning of the new year is a good time to reflect on the previous year. In the fall of 2016, we had the exterior of our home painted by Jackson Painting Inc.
Due to our experience with other painting companies, we approached this with apprehension. WHAT A SURPRISE ! Your crew was skilled, efficient, courteous and most importantly cleaned-up after themselves. Jackson Painting is the most professional painting company we have ever dealt with. We will gladly recommend you and your company. 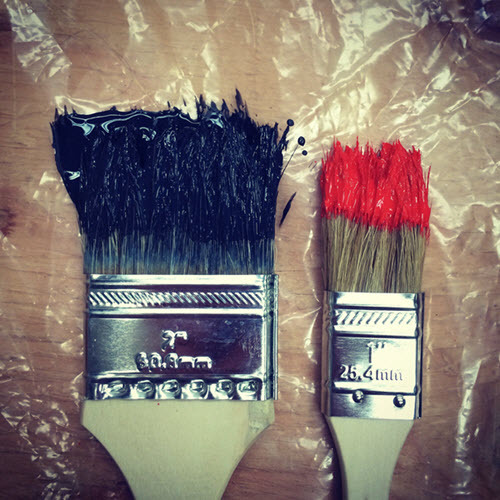 We will be calling you for our next painting project. We were very pleased with both Ken Zeegers and his crew in their expert workmanship and attitude in completing the painting of our home. They assisted us with making appropriate selections in types and colors of paint and were only satisfied with their work when we were satisfied. I would definitely recommend them to anyone and give them a 5-star rating. I am very pleased to recommend Ken Zeegers and Jackson Painting. His team has executed our 5-year repainting plan for our 17 unit condominium in an outstanding manner. His performance has successfully maintained our curb appeal and long term material preservation. It has been a true pleasure to work with him and his team. Jock P.President, La Vista Village Condo Assoc. with a note. Please feel free to use it as you see fit. cabinets painted later this year and Ken will do it for us. We love having Jackson Painting in our home! They are hard working, competent and punctual professionals (they even arrived after a big snowstorm when the roads were impassable) who do an outstanding job. Jackson Painting primed, patched and painted the woodwork, walls, ceiling, beams and plantation shutters in our 3800 square foot home in 2 weeks. The crew was great to work with and were very interested in our being happy with their work….and we were! Ken Zeegers wants happy customers and he delivers. He returns your calls (We know, who does that these days?) and he delivers on his promises. He worked with us to make sure that our paint color was exactly what we wanted. We wanted our woodwork to be free of brush marks and his crew met our expectations. His quotes are reasonable and he knows the painting business inside and out. We tell everyone we know about Jackson Painting and many of our neighbors and friends now use them and speak highly of the quality of their work as well. We will never use any other painting company than Jackson Painting. They are truly the best painters in the area!! Check them out! We used Jackson Painting last year for the inside of our home and again this year for the outside. We have been very pleased both times with the quality of the work and for how they cleaned up at the end of each day. The price was a little less expensive than some of the other bids that we had gotten but the quality of the paint and workmanship was fantastic! We would certainly use them again!! Jackson Painting did an excellent job painting our home. Everything was done in such a timely manner, from beginning to end. The crew was very easy to work with and did an excellent job cleaning up after the job was finished. I would definitely recommend them for all of your painting needs! Jackson Painting did a great job for us. They were responsive to our calls and came to give us a bid in a timely manner, worked with us to find a convenient time for the job, completed the job within the time frame stated, did an excellent job, and the price was right. We have no complaints and will definitely use them again. unconnected garage. Both buildings have vertical shiplap cedar siding. five men were very presentable and friendly and worked steadily. They were well equipped and brush painted all surfaces carefully. competitive. I was pleased with the outcome.